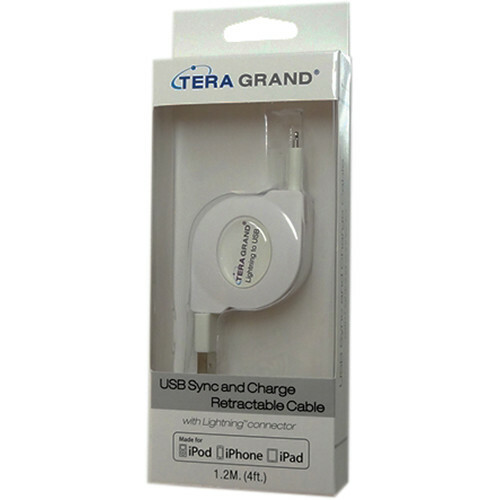 The white, 4' MFi Certified Lightning to USB Sync and Charge Retractable Cable from Tera Grand connects your iPhone, iPad, or iPod with Lightning connector to your computer's USB port or a USB power adapter for efficient syncing and charging. The cable can be extended to 4', and retracts when not in use to prevent tangling. The cable is Apple MFi certified, which means it been licensed and authorized by Apple to mark the MFi logo on the product. MFi is the abbreviation of Made for iPod, Made for iPhone, and Made for iPad. Box Dimensions (LxWxH) 7.4 x 3.0 x 1.0"